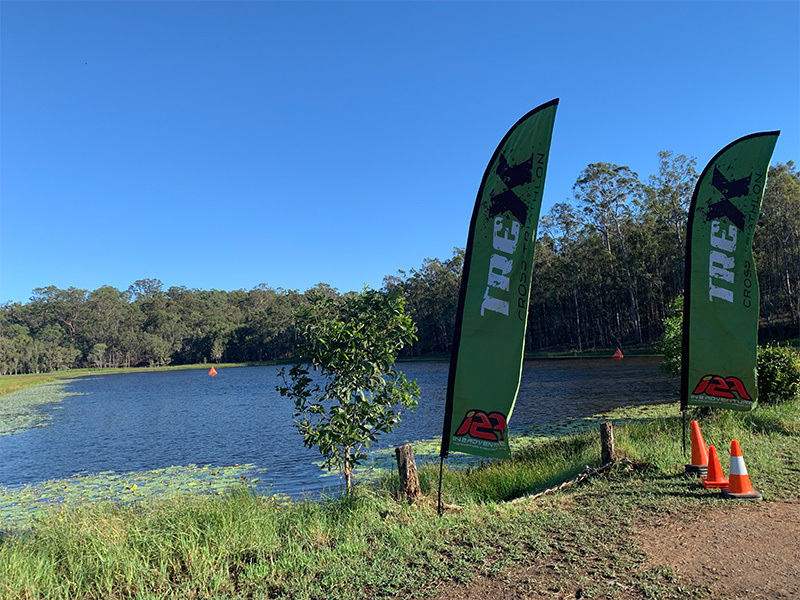 I went in my 3rd ever Cross Triathlon last weekend at In2Adventure’s TreX Triathlon. I can’t really say I ‘competed’ or I ‘raced’ but I went in it. I tend to enter races and not really think about whether I can do it before I enter, and this one was no different. I’d done a back to back event before – The Lamington Eco Challenge but it was just running and I trained for it. I still didn’t really consider how hard it would be to back up. And I knew I could run. The TreX back to back was a bit different in that I had to mountain bike each day, which I’m still really new at. Let me explain the event first. A Cross Triathlon is pretty similar to a regular (or road) triathlon, except it’s off-road. In this case it’s a dam swim. Cross Triathlon can have ocean, creek, river or dam swims, just like road triathlons. 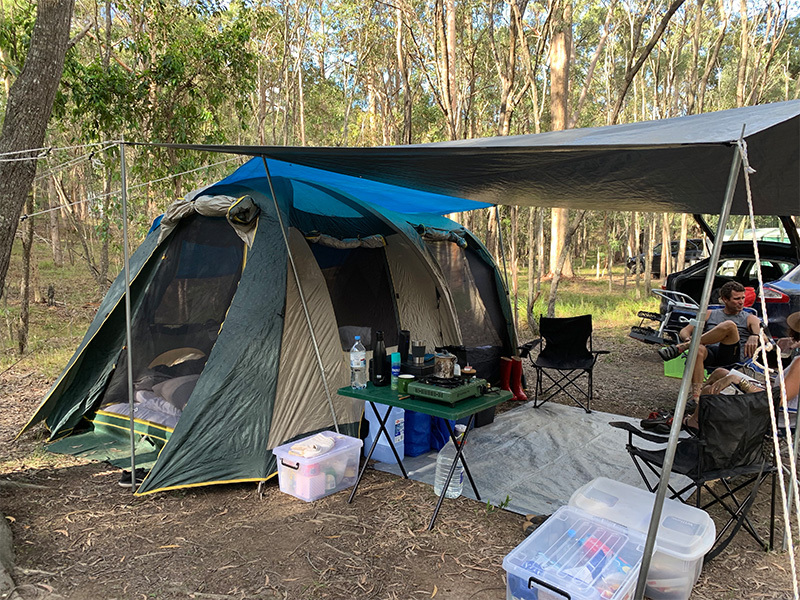 In this case, at Karingal Scout Camp, it’s in a dam. It’s a little bit reedy and murky and I probably would never swim in there if there weren’t other people swimming in there. But for some reason, I feel much safer with others in the water. Statistically, I’m less likely to be attacked if I’m 1 in 200 or even 1 in 3 than if I’m 1 in 1. The bike part of Cross Tri is on a mountain bike and the run is a trail run. 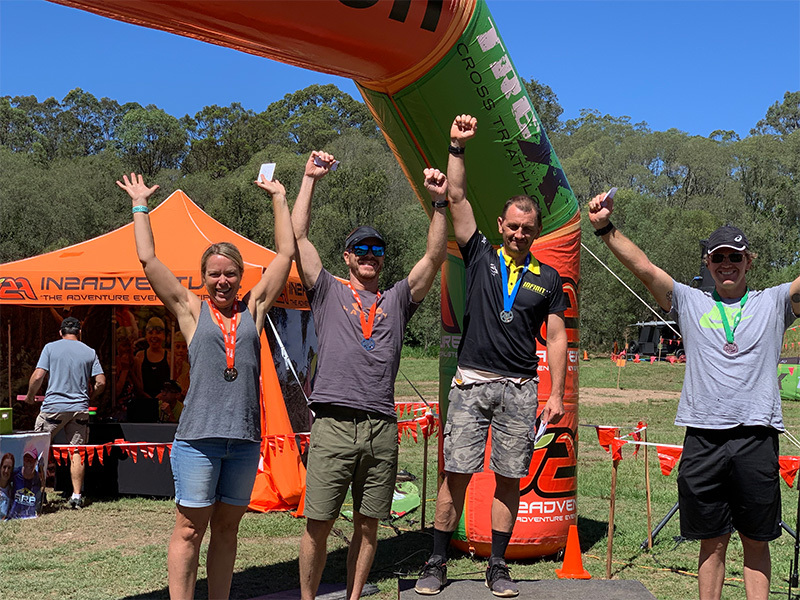 I love trail running, so a 500m swim and a 15km technical bike course were just two little things that I had to get through to enjoy a 4km trail run. The Back to Back event means you complete a triathlon on Saturday and back it up on Sunday. The distances are a little shorter than what I normally do – but backing it up makes it a little more difficult. The Back to Back consists of a 500m swim, 15km bike leg and a 4km trail run. 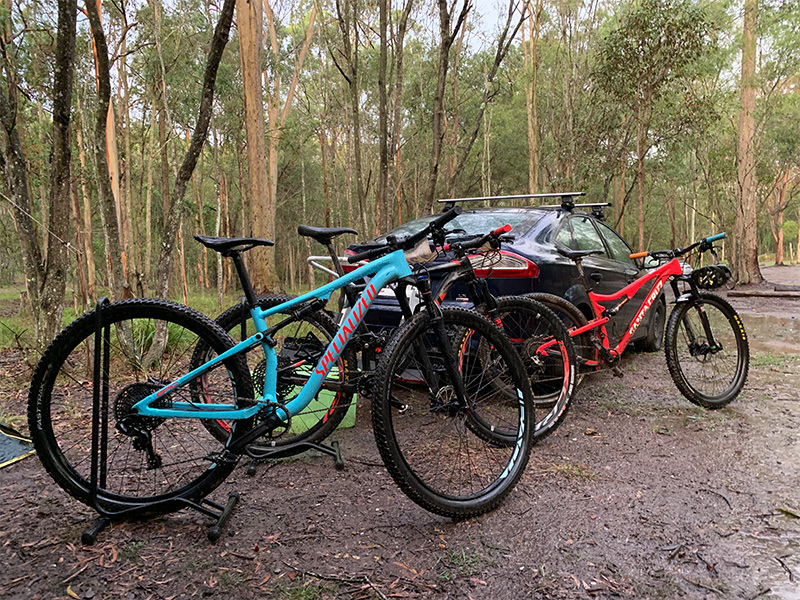 My partner had told me that the mountain bike course is really challenging and might be difficult for me, so just get off and walk if I didn’t feel like I had the skill to ride a section. We went out on Friday to ride the course. I was told that the first part uphill was probably the hardest but then we rode the next section, and it was harder. So maybe that was the hardest, until we rode the next section. At each point I was told it gets easier and nicer. And each time that was wrong. It got harder and more challenging. My head started to fill with doubt. I kept repeating to myself that this was beyond me, that I couldn’t do it. I’m going to be so slow. Riders are going to hate being behind me. It’s too hard. I can’t do it. I was starting to dread the race. I tried to just look forward to the run. A long time out swimming and biking for a 4km run! Anyway, we got our gear ready for the next day and because we were camping we went to bed early. Like always, I fell asleep quickly but 2 hours later I woke up thinking of the race. Dreading the race. By this time it was raining too which made it even harder to be positive about. I decided to start to read a book that I had downloaded on my phone called ‘Fast after 50‘. 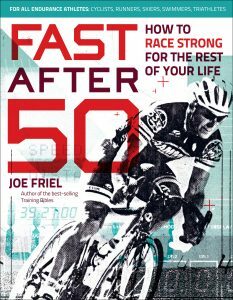 I started reading it not because I thought I could be fast after 50, but maybe I didn’t have to get slower, and maybe there was hope that miraculously, I’d be better! A quote by Mark Allen – 9 time Hawaii World Triathlon Champion started to make me think differently about the event. As you age, you need to keep learning new things. And I wasn’t going to get faster or even better if I didn’t do something differently, if I didn’t learn something new. So I decided that this event gave me a chance to learn something new. The first downhill part of the track is stairs – about 10 of them. I can roll over 1 or 2 stairs, but in the practise ride I had baulked at about the 4th step because of its height. I got off and walked the rest. That night lying in the dark I decided that I would – that I could – roll over those stairs without getting off. So that became my goal. Learn something new, practise something new – practise rolling down stairs. The bike course was a 2 lap course and so over the 2 days I was going to be going over those stairs 4 times. I fell asleep again thinking of those stairs. And woke, thinking of those stairs, to the sound of rain! Which meant the stairs just got a little bit harder. We walked down from our campsite to race HQ, registered, got our numbers and racked our bikes. Every minute that passed made me feel more nervous and I little bit sicker. Everyone was huddled under the tent out of the rain, trying to be positive. All I could think of was, I can’t wait for the run – just 2 hours of swimming and biking and then I get to run. The rain stopped just before we started the swim. My swimming hasn’t been going great lately, so I like to joke around and pretend that I can swim just like a mermaid. As I got in the water, everyone’s spirits were high – or maybe they were just as nervous as I was and putting on a brave face. The hooter sounded and I reminded myself to be a mermaid. The swim was in an M shape and each time I passed a buoy I realised I wasn’t coming last, and I even passed a couple of men doing breaststroke from the wave in front. (TreX races really are for everyone – no matter what your skill level). I got out of the water and onto the bike, climbed the first hill. I actually like climbing up, as long as it’s not too technical ie no tree roots, or tight switchbacks. Then I got to the dreaded stairs. I rolled down the first one, and then the second, and the third and the fourth and kept going until I’d passed all of them. First test passed! That gave me some confidence and I just started to think, just do what you can, get off where you have to and finish in one piece. With the rain falling and the wet, slippery conditions, there was no pressure. Sure I might be almost last, but at least I’m not holding anyone up who’s trying to get passed. As the kms went passed I was on and off the bike, trying to stay on but slipping on tree roots, getting off on purpose instead of going head first over the handlebars and, to be honest, actually enjoying it. Lap two came and went and I got onto the run leg that I was looking forward to, and it was tough! Tougher than I was thinking it would be. 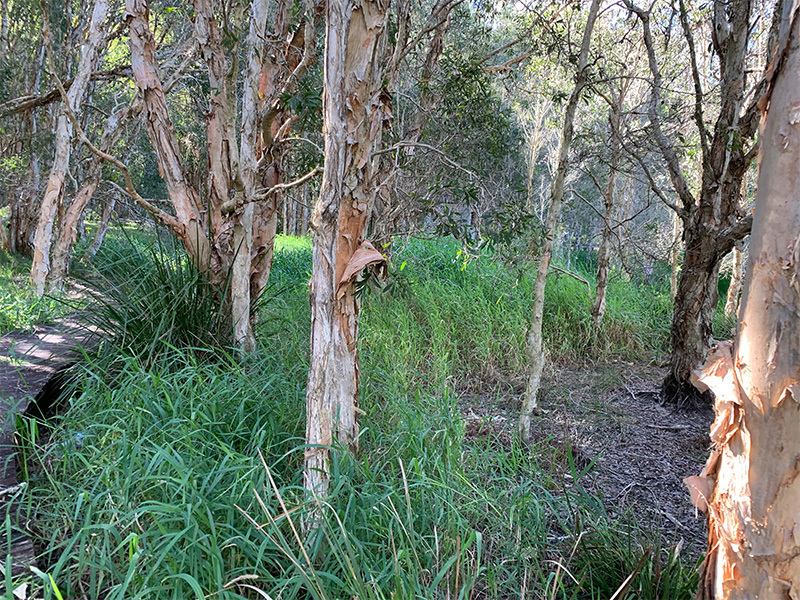 Hills, slippery boardwalks, ankle deep mud, knee deep wading through muddy, tadpole filled water. The run had it all. It was a true off-road trail run. And 4km later it was all over. I finished in 2 hours and 10 mins and I didn’t die. And I had the best fun. I was covered in mud, tired and sore but smiling. I’d call that success. Day 2 came around pretty quickly. We spent Saturday afternoon hanging around the camp ground. I had a little nap and other than that, we just sat under cover out of the rain, which finally stopped around 7pm. Sunday morning I was less nervous. Everyone was talking about how much better the track was going to be. It would be sticky and dry. 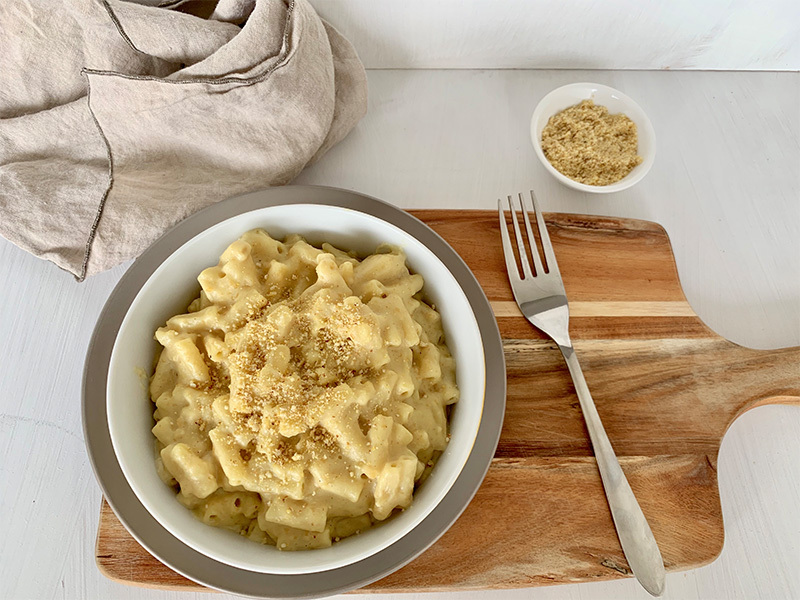 I don’t really know if sticky is good or not – there are a lot of things still to learn! The race started and once again I tried to transform into a mermaid. Maybe I was unsuccessful, but the swimming felt better. 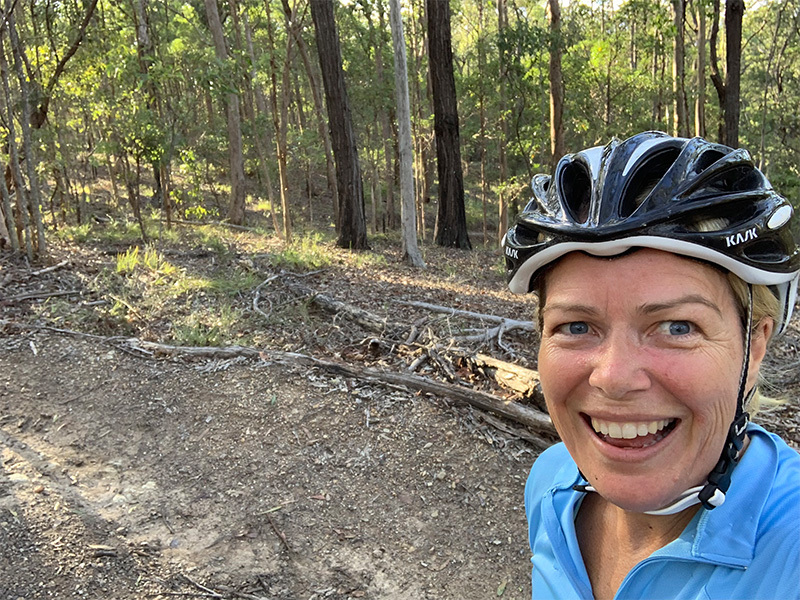 I actually found day 2 of the bike a little bit more difficult – maybe just mentally, because day 1 there was no expectation, but on day 2 I knew what to expect. And continuing on the learning something new and trying something different vein, I managed to ride down one of the steep downhills on my last lap round. The previous 3 laps I had walked my bike down. Just keep trying something new. The winner of the event, Dean Cane, had passed me on both days during the bike leg, but earlier on day 2. Either he was going faster or I was going slower. I knew what to expect in the run and enjoyed day 2 of the run so much more than day 1. I finished day 2 six minutes faster than day 1. My swim was longer, so most of that 6 minutes was on the bike – mostly due to the dry conditions because I’m sure I was more tired on day 2. The one thing I can say about the TreX races I’ve done is the friendliness of the event organisers and competitors. It’s such a relaxed, laid back event, and even though it scared the bejesus out of me, I can’t wait to do it again. 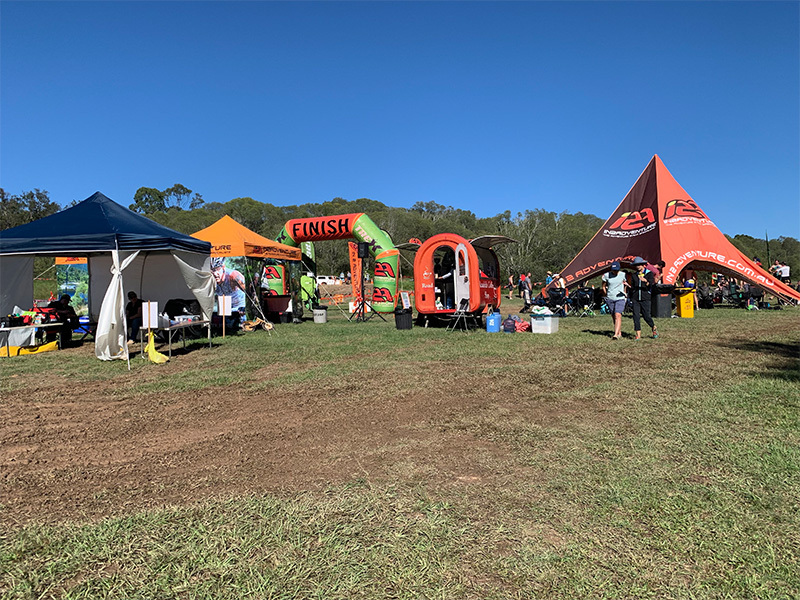 Next time at Landsborough. Oh, and I managed to get 2nd in my age group. Let’s ignore the fact that there were only 2 of us in it (the rain had scared a few people away), I still managed to stand on the podium.